Do you ever feel like innovation in the fishing industry has slowed in the last few years? In the 1980s and 1990s, anglers saw the rise of Gore-Tex, the rapid advancement of graphite rod technology, and the explosion of the softgoods market, all of which revolutionized how we fish and the conditions we can treat as acceptable for fishing. In the 2000s, however, what has changed? Well, for one thing, rod manufacturers continue to look for the Next Big Thing. With the U.S. defense industry reinvigorated in recent years (always, along with the space program, a source of innovation), manufacturers are starting to see promising technology on the horizon. 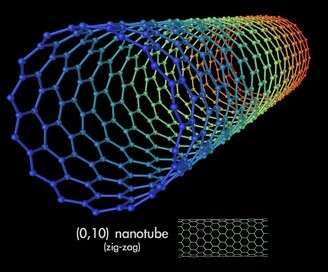 One manufacturing source recently told me that his company is looking closely at carbon nanotube technology. Carbon nanotubes are cylindrical molecular structures based on (and akin to) “buckyballs.” They have a lot of weird properties, but as far as fishing goes, they’re potentially useful because they have amazing strength for their weight. “That means we might be able to put together a fly rod with far thinner walls, which would make it more responsive, with lower swing weight and a generally amped up profile,” my source says. The key to using carbon nanotubes in fly rod design lies in their alignment; when aligned randomly or sprinkled into the resin, they are not as useful. However, a new manufacturing technique has allowed the nanotubes to be aligned vertically, like traditional graphite fiber, and further processed into sheets (which can be cut and rolled, again like normal graphite). Are carbon nanotubes the next big thing? Maybe, maybe not, but it’s at least nice to know something‘s on the horizon. the 2000s? Let us know in the Comments section!